I choose to spend the last weekend of summer at Blaxy Premium Resort, located in 23 August, at the Black Sea, in Romania. Blaxy introduced a new concept in Romania: periodic property (condos). You can buy a condo for one week per year and you’ll own it for life. I wrote about it here. And, starting with the 1st of May 2016, the resort is also available for tourists who can book a night or many in one of the classy rooms they offer. So I went there with my bestie to spend the weekend. Immediately as we arrived, I noticed the first advantage on the complex. It is situated far from the city and other tourist resorts, between the shores of Black Sea and Tătlăgeac Lake. It is so quiet there, that you have no other option but to relax. After we checked-in, we went upstairs where we could admire the sea from the 10th floor (and highest) of the complex. The condo is nice, clean, it smells fresh. Combining white with blue for the decorations I think it was an extraordinary idea for a luxury complex at the seaside! The cabin shower impressed us, it was very large! And I liked that the trash can has its place near the door, having exits both within and outside the room, so that the maid can empty it through a little metal door without even entering the room! Getting tanned: by the sea or by the pool? After the accommodation, we went to the private beach of the hotel, which is situated at 250 m. I liked the fact that there is a little bar by the beach, but also comfortable lounges beds with mattresses and umbrellas, for free. The beach is very wide, so, although there are many people, you don’t feel like it’s crowded. The sand on the beach is very smooth and the sea level is not that high, ideal for children and people who doesn’t know to swim, like me! After a short tanning session by the beach, we moved at the pools to enjoy the crystal-clear water and the incredibly comfortable lounges there – giving you the feeling that you can actually sink in them. The water was a little bit cold for me – due to the windy weather foretelling the end of the summer. But even so I spent some time there because I liked it! So, I can say that the ideal tanning session for me is completed in two steps: sunbathing on the beach and having a refreshing bath in the pool. To be honest, we did not eat our dinner at the resort. There is an improvised restaurant behind the amphitheater until they will complete the next buildings in the plan. We decided instead to eat on the beach, near the Resort. So we went to a very famous fishery, named Popasul Pescarilor (the Fishermen’s Halt). On my part, I can tell you that I did not regret it, because I ate the best royal seabream that I ever had! In the morning, we had breakfast at the resort. It didn’t impress me at all, though. What I did not like was that there weren’t any mugs for coffee and tea. Only small plastic glasses – which literally burned your hand if you dared to try holding them. Also, you had to go for a juice or water refill 4-5 times. The cost of a week stay at the Blaxy Premium Resort Hotel is ranging from 2,500 lei (low season) to 4,000 lei (in August) in a condo type room for two adults and 2 children, including breakfast and access to all resort facilities. At request, you can also be granted all inclusive services at the price of 90 lei / day / person. Otherwise, all services are free: sun beds, umbrellas, pool access, participation in various activities and performances. The resort already has three buildings completed and functional, but it is not finished yet. 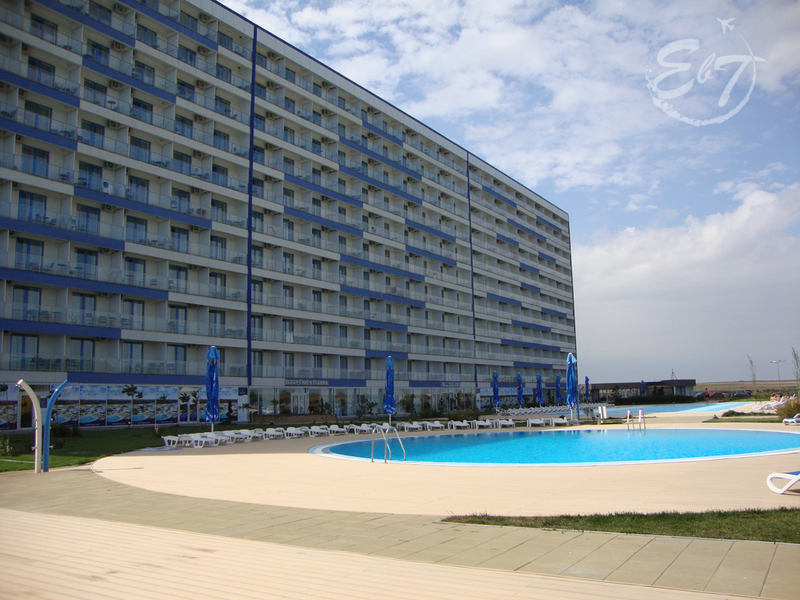 According to the construction plans, it is announced to be the biggest resort on the Black Sea. It lays on 72.000 square meters and includes 4 pools (one for children), bars, kids play zone, summer theatre (an amphitheater), a private beach of 10.000 square meters, and a forest where the owners have arranged spaces for different activities (archery, relaxing). The managers of the resort are planning to add other four buildings, a conference hall of 1,000 seats, restaurants, sports shops, a spa treatment center as the complex sits on a boiler of thermal waters. Above the spa, they will add a 5 * hotel with 400 rooms. The plan includes a passage under the train track that passes in the proximity of the complex, for the safety of those who need to cross the track in order to get to the beach. For now, there is a watchman that makes sure that everyone crosses the track with no incident.